In a volatile steel market where growth is coming from favorable global economic momentum, but also facing risks from rising global trade tensions, there are very few levers in the industry to drive differentiation and profitability. The very nature of this high-volume and low margin business means that cost per ton is a survival metric for steel mills. Optimizing cost per ton has become an important science. This managing of margins from within means a focus on efforts to avoid unplanned downtime, optimize maintenance spend and resources, and mitigate production losses. The effectiveness of the maintenance and reliability function is particularly critical to the managing of margins. In short, maintenance and reliability (M&R) groups ensure that mill equipment functions as needed to meet production requirements. This means that M&R is a major factor in production capability. And, without production capacity, the business fails to produce quality product that is delivered to the customer on time. Why is the steel industry lagging behind? Since 1987, the World Steel Association (worldsteel) has worked with steel manufacturers and reported the results in an industry benchmarking report. Their most recent report surmises that many steel companies have not yet achieved the full potential of a world-class maintenance organization. Worldsteel reports that many steel companies around the globe are still performing below the average results of the top quartile of mills, with 90% of steel mills operating with excess costs and only 3% operating at full financial optimization levels. In today’s current environment, many companies are struggling to take a step forward from their reactive or “firefighting” maintenance cultures that are driving these inefficiencies. To climb out of this rut, companies must take a strategic approach to asset management. When it comes to driving cost efficiency and reliability improvements, leading adopters are letting risk guide their strategy and decision making. Defining quantitative asset criticality for your organization can guide how maintenance spend, resources, and focus should be applied across your facilities. Through this lens of risk comes a significant opportunity for the steel industry to converge both preventive and condition-based maintenance activities to drive cost optimization and reliability improvements. This approach enables a quantitative risk assessment methodology to be the driving factor for determining the right recipe of preventative maintenance (PMs), and condition-based technologies and tactics that should be applied to an asset or system. Technologies like asset performance management are equipping the steel industry to sustain these methodologies, not only to develop and deploy these comprehensive asset strategies, but also to track the effectiveness of PMs and emerging threats from condition-based anomalies. This shows an example of how quantitative criticality assessment can inform a strategic approach to maintenance strategy development and technology deployment. Gerdau, a leading steel manufacturer, was looking to reduce their annual maintenance spend while also improving productivity, thus targeting margin improvements within their manufacturing operations. Gerdau partnered with us to implement some of our industrial solutions, including Asset Performance Management (APM) and Historian, as well as leverage our Industrial Managed Services for remote monitoring—allowing them to focus on their critical subset of assets using predictive diagnostics. This technology enabled Gerdau to model their expected performance of each individual asset and its failure modes against actual conditions of various measurement points on an asset or system. This leads to early identification of issues to allow significant time to plan the appropriate PM activities to avoid functional failures. As a result, Gerdau had two major “catches” in the first 6 months of their deployment, helping them to avoid 130 hours of downtime in their Sinter plant. They estimate their annual savings from their new capabilities to be $4.5 million per year and the ROI payback on the project is only 8 months. And this is only one example. The steel industry has a lot to gain with the adoption of digital mill technology to help improve maintenance outcomes. The industry’s unique growth levers make the it ripe for improvement and digital transformation can help them solve their preventative maintenance problems. To learn more about how GE Digital can help you improve your mill productivity and cost per ton, visit our steel industry webpage. Track production losses and find hidden capacity in your operations. 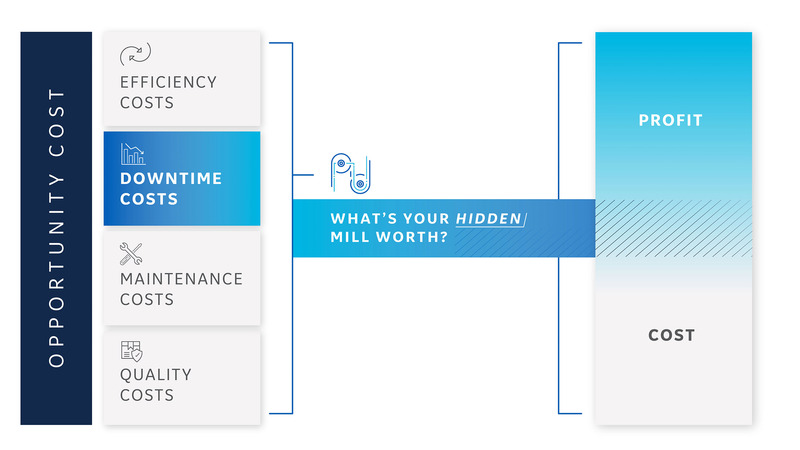 How can we help you drive value from predictive maintenance strategies?